Orlando is a world-class paradise for tourists, both young and old. Home to the vast Disney World complex, the city is overflowing with man-made wonders and natural sightseeing opportunities. Those looking for more than Orlando's endless array of theme parks will not be disappointed, with museums, art galleries, an incredible selection of restaurants, large areas of green and plenty of shopping malls in plentiful supply throughout this part of Florida. Many holidaymakers choose to stay within official Disney hotels, where guests are able to enter the parks up to 90 minutes earlier than the general public, meaning that they can enjoy queue-free rides before the attractions officially open. 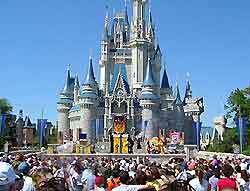 Orlando vacation rentals provide a good lodging option for family groups, while those prepared for a short drive each day will discover that the hotels within nearby Kissimmee are much better value.